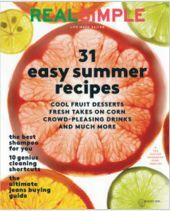 The August 2015 issue of Real Simple magazine (August 2015 issue) included an article on chronic pain featuring Dr. Paul Christo. The article, “Pain” by Amy Paturel addressed how to understand (and manage) your body’s most important warning system- and what to do when it goes awry. Dr. Christo discussed how chronic pain differs from acute pain in the central nervous system, and explained the role hormones play when it comes to pain, especially in women. Also featured in this article is University of Michigan Fibromyalgia expert Dr. Daniel Clauw, whom Dr. Christo interviewed for a past episode of Aches and Gains with actress A.J. Langer.